Desk Lamp and phone charger designed by Bernard Maets. Mr. Maets specialized in a wide variety of weapons and tools using steam as the primary energy source. Bernard began building lamps in a variety of styles after a meeting with Thomas Edison. 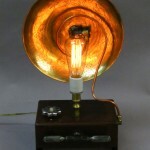 Fully functional lamp with an internal AC outlet to charge your phone or Ipod. Edison bulb gives a warm light and is enclosed in steel cage. Small brass fish on lid of box. Discovery and recovery continues at the shop complex in southeast Wisconsin used by Bernard V. Maets from 1878 to 1907. Many crates of miscellaneous parts have been obtained by the foundation.